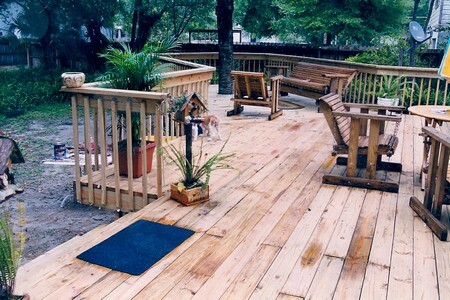 You can build up your own deck steps without relying on contractors or any professional. Read the following rules so that you can build your deck boards quicker. Materials Required: Angle Irons, Hammers, Galvanized Common Nails and Screws, Handsaws, Circular Saws, Measuring Tapes, Lumber, Joist Hangers (optional), Framing Combination Squares, Levels, Pencils, Bolts (optional), Electrically Variable speed drills and Lag Multiuse Screws. Calculating of no of steps and Building of the steps is explained below. Measure the height of the deck and divide the height by 6 or by 7 inches (standard height). It gives you know of steps you will need from ground to top of deck. Calculate the front to back width. Make sure that double the rise height (R) and width of the tread must lie between 24 to 26 inches. Otherwise, (2xR) +T=24 to 26. If a riser is 6 inches in tall, the tread must measure between 12-14 inches. Some adjustment can be done with respect to users comfort. Put the foundation and place a kicker plate, in case needed. Kicker plate is the one that is attached to foundation with concrete nails or bolts and stairs bottom can be attached. Use the measurements of steps that were done in section1 and transfer it into 2X12 treated board which acts as a first stringer. A stringer contains the pattern cut which helps to form your calculation for stair-size. Mark the height of a step on the arm of the framing square which is shorter. Then place it on the board with the marking on the outer edge of the board and keep the square in position and then slide it up to down until the dimension of width on the long arm of the square is on board’s edge. Make a trace around the framing square on outer edge and the tracing must show V shape. Continue the same process of marking treads and the board must show VVV shape. Now reduce the thickness of tread from the stringers bottom and notch out bottom so as to fit around kicker plate. With the use of circular saw or handsaw, cut along the traces. Then check deck alignment and trace it and use the first stringer pattern to cut a second stringer. And attach the stringers stops with the exposed joists by using bolts or with end or rim joists using angle brackets or joist anchors. With the use of lag screws, attach the stringers bottom with the kicker plate or base. Leaving ¾ inch overhang on either side cut the treads and risers to desired width of the stairway. Finally nail or screw the risers in position, and add treads. Fasten the riser’s bottom edges to the back of the treads.